Designed to safeguard pedestrians, buildings and equipment from floor to height both inside and out. The addition of a Traffic Rail at the base provides greater resistance to vehicle impacts. The energy-absorbing high level barriers protect from the lowest to the highest level, separating traffic, shielding people and property, and preventing the dangerous toppling of stacked goods. Ideal for high-storage areas with high traffic movement. High rail levels allow for increased stacking storage, preventing dangerous topple accidents. "The A-SAFE barrier is more flexible, has greater visual impact, is easy to install and can be repaired if required. The current steel barriers are not flexible, more complex to install due to requiring mounting holes cut in the base floor and, if damaged, have to be removed and replaced fully. 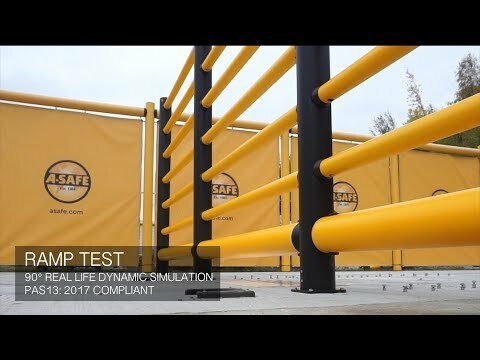 The new A-SAFE barriers offer a safe and secure demarcation between people and moving vehicles. The robust yet flexible design, coupled with the highly visible colouring, provides the ideal safe barrier."